Maguire's performance could be likened to that of Russell Crowe's fractured John Nash in A Beautiful Mind. Unchallenging but likable enough in his most popular role as Spider-Man, Maguire ferociously plays Fischer as a man whose focus at the chessboard belies his scattered, myopic thinking about life, the world, and his place in it. Maguire uses Fischer's keen intelligence as a kind of violent cudgel, browbeating his family and friends into either devotedly following him or making way as he scorches everything in his path. This, despite the fact that Fischer's general outlook on life seems to mirror his perspective on chess in some very unhealthy ways. 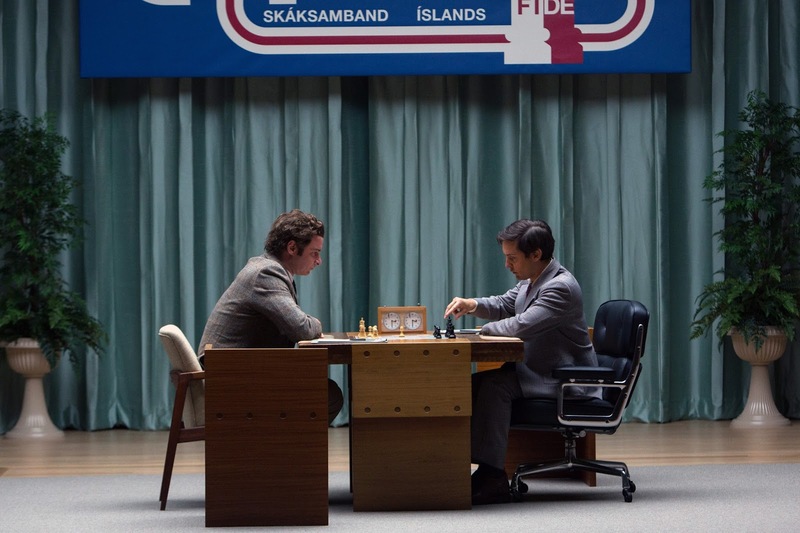 He finds intricate patterns of conspiracy where there are none, angrily denouncing a vast, Jewish conspiracy while denying his own Semitic heritage and paranoically asserting that both the American and Soviet governments are spying on him while attending the World Chess Championship 1972 in Reykjavík, a city he eventually returns to for asylum when evading U.S. and Japanese authorities seeking to extradite him later in life. Maguire is supported by an array of notable performances. Peter Saarsgaard plays Father William Lombardy, a chain-smoking, foul-mouthed priest who also happens to be a chess grandmaster. Serving as the occasional sounding board, Sarsgaard reveals the irritation and cynicism that accompanies the benevolence of service to a genius who many also consider an alienated sociopath. Lily Rabe plays Bobby's sister Joan, grounding Maguire by delineating the working-class, ethnic roots Bobby Fischer would later turn his back on. Playing Paul Marshall, an amalgamation of advisors, Michael Stuhlbarg salvages what could have been a thankless cipher of a role. 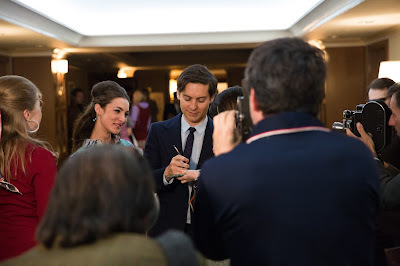 Stuhlbarg supplies a quirky stand-in for the viewer whose double-dealing makes us complicit in the elevation of a wounded man to celebrity status at the expense of his fragile sanity. 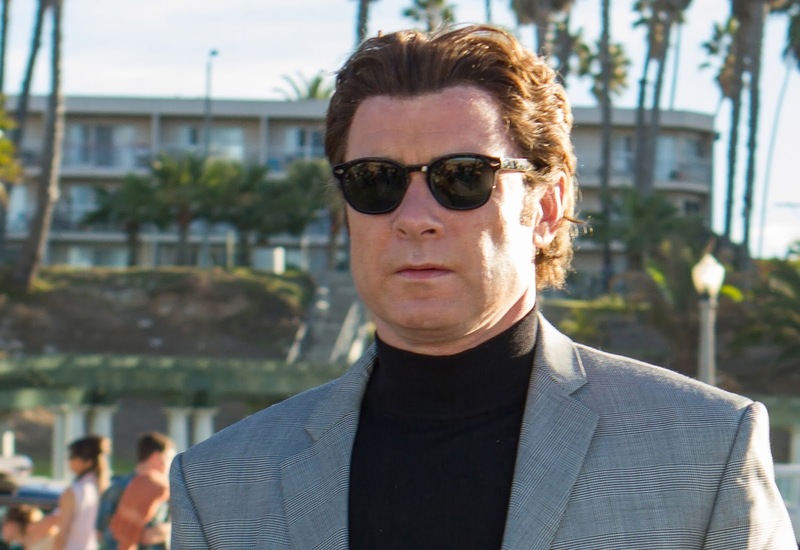 The true standout here is Liev Schreiber as Fischer's Russian competitor, Boris Spassky. Not since John Garfield has someone so pug-ugly offered such breadth of charisma with such facility as Schreiber does here, perfectly getting at the push-pull appeal of the Soviets. And he achieves this speaking mostly in Russian. Ultimately, it is very hard to feel the kind of onscreen stakes Zwick (Glory) seems to want us to with a game as cerebral as chess. 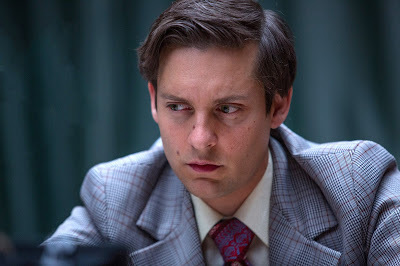 Pawn Sacrifice comes pretty close to enthralling us as it pursues this elusive goal, thanks to Zwick's usual fine direction of a well-rounded cast to some award-worthy performances. For Maguire, at least, his turn as Fischer may be a career-best.